Scoliosis is a side-to-side curvature of the spine. When viewed from the rear, the spine usually appears perfectly straight. Scoliosis is a lateral (side-to-side) curve in the spine, usually combined with a rotation of the vertebrae. (The lateral curvature of scoliosis should not be confused with the normal set of front-to-back spinal curves visible from the side.) While a small degree of lateral curvature does not cause any medical problems, larger curves can cause postural imbalance and lead to muscle fatigue and pain. More severe scoliosis can interfere with breathing and lead to arthritis of the spine (spondylosis). Approximately 10% of all adolescents have some degree of scoliosis, though fewer than 1% have curves which require medical attention beyond monitoring. Scoliosis is found in both boys and girls, but a girl's spinal curve is much more likely to progress than a boy's. Girls require scoliosis treatment about five times as often. The reason for these differences is not known. Four out of five cases of scoliosis are idiopathic, meaning the cause is unknown. While idiopathic scoliosis tends to run in families, no responsible genes had been identified as of 1997. Children with idiopathic scoliosis appear to be otherwise entirely healthy, and have not had any bone or joint disease early in life. Scoliosis is not caused by poor posture, diet, or carrying a heavy bookbag exclusively on one shoulder. Infantile. Curvature appears before age three. This type is quite rare in the United States, but is more common in Europe. Juvenile. Curvature appears between ages 3 and 10. This type may be equivalent to the adolescent type, except for the age of onset. Adolescent. Curvature appears between ages of 10 and 13, near the beginning of puberty. This is the most common type of idiopathic scoliosis. Adult. Curvature begins after physical maturation is completed. Congenital scoliosis is due to congenital abnormal formation of the bones of the spine, and is often associated with other organ defects. Neuromuscular scoliosis is due to loss of control of the nerves or muscles which support the spine. The most common causes of this type of scoliosis are cerebral palsy and muscular dystrophy. Degenerative scoliosis may be caused by degeneration of the discs which separate the vertebrae or arthritis in the joints that link them. Scoliosis causes a noticeable asymmetry in the torso when viewed from the front or back. The first sign of scoliosis is often seen when a child is wearing a bathing suit or underwear. A child may appear to be standing with one shoulder higher than the other, or to have a tilt in the waistline. One shoulder blade may appear more prominent than the other due to rotation. In girls, one breast may appear higher than the other, or larger if rotation pushes that side forward. Curve progression is greatest near the adolescent growth spurt. Scoliosis that begins early on is more likely to progress significantly than scoliosis that begins later in puberty. More than 30 states have screening programs in schools for adolescent scoliosis, usually conducted by trained school nurses or gym teachers. Diagnosis for scoliosis is done by an orthopedist. A complete medical history is taken, including questions about family history of scoliosis. The physical examination includes determination of pubertal development in adolescents, a neurological exam (which may reveal a neuromuscular cause), and measurements of trunk asymmetry. Examination of the trunk is done while the patient is standing, bending over, and lying down, and involves both visual inspection and use of a simple mechanical device called a scoliometer. If a curve is detected, one or more x rays will usually be taken to define the curve or curves more precisely. An x ray is used to document spinal maturity, any pelvic tilt or hip asymmetry, and the location, extent, and degree of curvature. The curve is defined in terms of where it begins and ends, in which direction it bends, and by an angle measure known as the Cobb angle. The Cobb angle is found by projecting lines parallel to the vertebrae tops at the extremes of the curve; projecting perpendiculars from these lines; and measuring the angle of intersection. To properly track the progress of scoliosis, it is important to project from the same points of the spine each time. Occasionally, magnetic resonance imaging (MRI) is used, primarily to look more closely at the condition of the spinal cord and nerve roots extending from it if neurological problems are suspected. Treatment decisions for scoliosis are based on the degree of curvature, the likelihood of significant progression, and the presence of pain, if any. Curves less than 20 degrees are not usually treated, except by regular follow-up for children who are still growing. Watchful waiting is usually all that is required in adolescents with curves of 20-30 degrees, or adults with curves up to 40 degrees or slightly more, as long as there is no pain. For children or adolescents whose curves progress to 30 degrees, and who have a year or more of growth left, bracing may be required. Bracing cannot correct curvature, but may be effective in halting or slowing progression. Bracing is rarely used in adults, except where pain is significant and surgery is not an option, as in some elderly patients. Two general styles of braces are used for daytime wear. The Milwaukee brace consists of metal uprights attached to pads at the hips, rib cage, and neck. The underarm brace uses rigid plastic to encircle the lower rib cage, abdomen, and hips. Both these brace types hold the spine in a vertical position. Because it can be worn out of sight beneath clothing, the underarm brace is better tolerated and often leads to better compliance. A third style, the Charleston bending brace, is used at night to bend the spine in the opposite direction. Braces are often prescribed to be worn for 22-23 hours per day, though some clinicians allow or encourage removal of the brace for exercise. Bracing may be appropriate for scoliosis due to some types of neuromuscular disease, including spinal muscular atrophy, before growth is finished. Duchenne muscular dystrophy is not treated by bracing, since surgery is likely to be required, and since later surgery is complicated by loss of respiratory capacity. Orthopedic surgery for neuromuscular scoliosis is often done earlier. The goals of surgery are to correct the deformity as much as possible, to prevent further deformity, and to eliminate pain as much as possible. Surgery can usually correct 40-50% of the curve, and sometimes as much as 80%. Surgery cannot always completely remove pain. The surgical procedure for scoliosis is called spinal fusion, because the goal is to straighten the spine as much as possible, and then to fuse the vertebrae together to prevent further curvature. To achieve fusion, the involved vertebra are first exposed, and then scraped to promote regrowth. Bone chips are usually used to splint together the vertebrae to increase the likelihood of fusion. To maintain the proper spinal posture before fusion occurs, metal rods are inserted alongside the spine, and are attached to the vertebrae by hooks, screws, or wires. Fusion of the spine makes it rigid and resistant to further curvature. The metal rods are no longer needed once fusion is complete, but are rarely removed unless their presence leads to complications. Spinal fusion leaves the involved portion of the spine permanently stiff and inflexible. While this leads to some loss of normal motion, most functional activities are not strongly affected, unless the very lowest portion of the spine (the lumbar region) is fused. Normal mobility, exercise, and even contact sports are usually all possible after spinal fusion. Full recovery takes approximately six months. Numerous alternative therapies have been touted to provide relief and help for individuals with scoliosis, but none have been proven beneficial in clinical trials. These include massage, physical therapy, and electrical stimulation. In addition, alternatives such as physical therapy, rolfing, or chiropractice manipulation may provide improved flexibility, stronger muscles, and pain relief, but cannot prevent or correct the curvature of the spine or its natural progression. Although important for general health and strength, exercise has not been shown to prevent or slow the development of scoliosis. It may help relieve pain from scoliosis by helping to maintain range of motion. Aquatic exercise, in particular, can increase flexibility and improve posture, balance, coordination, and range of motion. Because it decreases joint compression, it can lessen the pain caused by scoliosis or surgery. Good nutrition is also important for general health, but no specific dietary regimen has been shown to control scoliosis development. In particular, dietary calcium levels do not influence scoliosis progression. Chiropractic treatment may relieve pain, but it cannot halt scoliosis development, and should not be a substitute for conventional treatment of progressing scoliosis. Acupuncture and acupressure may also help reduce pain and discomfort, but they cannot halt scoliosis development either. The prognosis for a person with scoliosis depends on many factors, including the age at which scoliosis begins and the treatment received. More importantly, mostly unknown individual factors affect the likelihood of progression and the severity of the curve. Most cases of mild adolescent idiopathic scoliosis need no treatment and do not progress. Untreated severe scoliosis often leads to spondylosis, and may impair breathing. Degenerative arthritis of the spine, sciatica, and severe physical deformities can also result if severe scoliosis is left untreated. Finally, scoliosis can also poorly affect the individual's self-esteem and cause serious emotional problems. There is no known way to prevent the development of scoliosis. Progression of scoliosis may be prevented through bracing or surgery. Exercise and physical fitness are of paramount importance for all individuals affected with scoliosis. They not only work to maintain flexibility and health, but decrease the likelihood of osteoporosis, which in these individuals, can be extremely debilitating. Lyons, Brooke, et al. Scoliosis: Ascending the Curve. New York: M. Evans & Co., 1999. Bridwell, KH, et al., editors. "Parents' and Patients' Preferences and Concerns in Idiopathic Adolescent Scoliosis: A Cross-Sectional Preoperative Analysis." Spine 25, no. 18 (September 2000): 2392-9. American Physical Therapy Assocation. Scoliosis, P.O. Box 37257, Washington, DC 20013. Center for Spinal Disorders, PC. 8515 Pearl Street, Suite 350, Thornton, CO 80229. (303) 287-2800; fax: (303) 287-7357. http://www.cntrforspinaldisorders.com. National Scoliosis Foundation. 72 Mount Auburn St., Watertown, MA 02172. (617) 926-0397. The Scoliosis Association. PO Box 811705, Boca Raton, FL 33481-0669. (407) 368-8518. "Chiropractic Treatment of Scoliosis." Scoliosis World. Cobb angle — A measure of the curvature of scoliosis, determined by measurements made on x rays. Rolfing — A system of soft tissue manipulation and movement education to realign and reorient the body. Scoliometer — A tool for measuring trunk asymmetry; it includes a bubble level and angle measure. Spondylosis — Arthritis of the spine. lateral deviation in the normally straight vertical line of the spine; it may or may not include rotation or deformity of the vertebrae. Scoliosis occurs in both sexes, but girls are more likely to have more severe curvatures. It can occur at any age, and is most often noticed during adolescence when there is an accelerated growth rate and the deformity progresses to a severe curvature in a very short period of time. adj., adj scoliot´ic. Classification. There are two major types of scoliosis: postural and structural. Postural scoliosis does not involve fixed rotation of the vertebrae, is not usually pronounced, and can be corrected by exercise. Structural scoliosis is the result of changes in the body structure with fixed rotation of the vertebrae in the direction of the convexity of the curve. This type is further divided into three categories based on the cause and kind of deformity presented: congenital, neuromuscular, and idiopathic. Congenital scoliosis results from improper development of the spine during the third and fifth weeks of fetal life. Congenital abnormalities progress throughout early life and can interfere with normal growth of the trunk. Such defects rarely occur alone and are usually associated with other abnormalities in the newborn. Neuromuscular scoliosis results from muscular weakness, localized muscle imbalance, or neurologic dysfunction and paralysis. The curvature is flexible at first, with little rotation, but as the disease progresses, the curves become more pronounced and more rigid. Idiopathic scoliosis has no known cause. The most severe cases usually appear before puberty, but it can appear at any time from infancy to adulthood. It tends to run in families; the mode of inheritance is thought to be multifactorial. Detection. Most cases of scoliosis can be corrected if detected early and treated promptly before inflexible structural changes occur and cardiopulmonary complications develop. Since the early 1960's, screening programs for detection of scoliosis in school children have been initiated and several states now require periodic screening of all children in the public schools. Parents also are encouraged to look for early signs of the disorder in their children. The signs of scoliosis include: (1) one shoulder higher than the other or one scapula more prominent, (2) abnormal waistline tilt with more indentation on one side, (3) a tilting of the hips with one hip more prominent, and (4) a prominence of the posterior chest or the shoulder when the child bends over. Inspection of the adolescent child for these signs should be made every few months. Treatment. There are several ways in which scoliosis can be treated and corrected. Milder forms respond well to active and passive exercise, but the more severe structural defects require either nonsurgical immobilization or surgical correction. Nonsurgical modes of therapy involve some form of bracing of the spine, using either a special brace that consists of a leather girdle and neck ring connected by metal struts (the Milwaukee brace); or a less cumbersome molded plastic jacket. Rigid casting is also used, but less frequently than other methods. Application of a localizer cast is another orthopedic procedure that is sometimes used preoperatively to stretch muscles, and also after surgery to maintain alignment until the bone graft is healed. Various surgical techniques, determined by the type of structural defects present, are employed to realign the spine through the use of external or internal fixation and instrumentation in combination with spinal fusion to maintain normal curvature. Surgical intervention is indicated when the curve is more than 40 degrees or when a congenital curvature will inevitably progress if not treated by early stabilization. Structural scoliosis with vertebral rotation shown by rib rotation on bending forward. From Lissauer and Clayden, 2002. Abnormal lateral and rotational curvature of the vertebral column. Depending on the etiology, there may be one curve, or primary and secondary compensatory curves; scoliosis may be "fixed" as a result of muscle and/or bone deformity or "mobile" as a result of unequal muscle contraction. Abnormal lateral curvature of the spine. lateral curvature of the spine, a common abnormality of childhood, especially in females. Causes include congenital malformations of the spine, poliomyelitis, skeletal dysplasias, spastic paralysis, and unequal leg length. Unequal heights of hips or shoulders may be a sign of this condition. Early recognition and orthopedic treatment may prevent progression of the curvature. Treatment includes braces, casts, exercises, and corrective surgery. See also congenital scoliosis, idiopathic scoliosis, kyphoscoliosis, kyphosis, lordosis, spinal curvature. Orthopedics A lateral curvature of the spine typically seen in young ♀, often an incidental finding; severe symptomatic scoliosis may respond to surgery; scoliosis may occur alone or with kyphosis–kyphoscoliosis Etiology Congenital–eg, defect in vertebrae or fused ribs; acquired–eg, muscle paralysis due to polio, cerebral palsy, muscular dystrophy; idiopathic Clinical Fatigue, pain in spine after prolonged sitting or standing; as the spine curves laterally, a compensatory curve develops to maintain balance which may become more severe; severe scoliosis may cause respiratory problems. Abnormal lateral curvature of the vertebral column. Depending on the etiology, there may be one curve, or primary and secondary compensatory curves; scoliosis may be "fixed" as a result of muscle and/or bone deformity or "mobile" as a result of unequal muscle contraction. Scoliosis rarely produces any symptoms until it is well established; then backache, fatigue, and dyspnea from ventilatory compromise may occur. Diagnosis is based on physical examination, anteroposterior and lateral spinal x-rays, and by using the Cobb method to measure the angle of curvature. Scoliosis may be treated through the use of a brace to straighten the abnormal spinal curvature or with corrective orthopedic surgery (e.g., the placement of a supportive rod along the spine or spinal fusion). Muscle strengthening exercises should be done daily while in and out of the brace. Follow-up assessment and brace adjustment should be done periodically. As the skeleton matures, brace wear is gradually reduced to night-time use only. 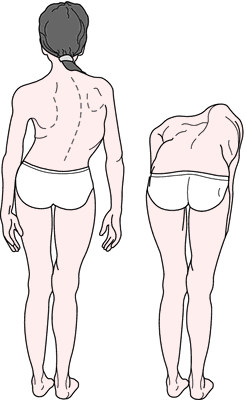 Surgery is indicated for scoliosis that progresses despite bracing. Postoperative visits are required for several months to monitor correction stability. Provisions are made to assist the adolescent and family to meet the psychosocial needs associated with the illness. The patient and family are taught about treatment management (cast-care, brace-use, traction, electrical stimulation, or surgery), exercises, activity level, skin care, prevention of complications, and breathing exercises. When necessary, preoperative teaching is provided, including preanesthesia breathing exercises, post-operative use of an incentive spirometer, surgical pain management, and prevention of thromboembolic or other complications. Following surgery, all general patient care concerns apply. Upon discharge, home-health care may be needed, and the school-age child or adolescent will require education in the home until he or she is able to return to school. Activity and activity limitations are explained, and diversional activities suggested. The patient is encouraged to provide self-care as much as possible. Wearing his/her own clothes, washing and styling his/her own hair, and applying make-up help to enhance morale. Educational and support resources are discussed with the patient and family. Pediatricians, pediatric nurse practitioners, school nurses, and other health professionals caring for children should include screening for scoliosis during physical examinations. Scoliosis due to fibrous scar tissue contraction resulting from necrosis. Scoliosis present at birth, usually the result of defective embryonic development of the spine. Scoliosis in the lumbar spine caused by tilting of the pelvis caused by a hip disorder. Scoliosis following empyema and retraction of one side of the chest. Scoliosis that is caused not by actual spinal deformity but by another condition such as unequal leg lengths. The curve reduces when the other condition is ameliorated. Scoliosis due to habitually assumed improper posture or position. Scoliosis caused by infection or inflammation near the spine, resulting in local muscle spasm. Scoliosis due to hip disease. 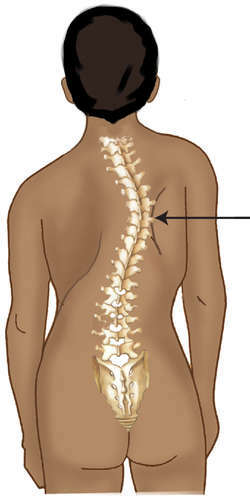 Scoliosis due to weakening of the spinal muscles. A structural scoliosis caused by congenital or acquired neurological disorders. Scoliosis from tilting of the head because of visual defects or extraocular muscle imbalance. Scoliosis caused by bony deformity of the spine. Scoliosis due to paralysis of muscles. An acute side shifting of the lumbar spine, usually away from the side of pathology. The body is attempting to move a nerve root away from a bulging intervertebral disk herniation. The patient assumes a laterally bent posture to reduce sciatic nerve symptoms. Scoliosis due to a difference in the length of the legs. An irreversible lateral spinal curvature that has a fixed rotation. The vertebral bodies rotate toward the convexity of the curve; the rotation results in a posterior rib hump in the thoracic region on the convex side of the curve. In structural scoliosis, the spine does not straighten when the patient bends. A spinal deformity in which the column is bent to one side usually in the chest or lower back regions. This may cause crowding of the ribs on one side. n abnormal lateral curvature of the spine, primarily affecting the thoracic vertebrae. Abnormal lateral curvature of the vertebral column. n a lateral curvature of the spine. lateral deviation in the normally straight vertical line of the spine; it may or may not include rotation or deformity of the vertebrae. Q. I work on a computer a lot. Sometimes after all the sitting my back hurts. what can I do to pass the pain? I work on a computer a lot. Sometimes after all the sitting my back hurts. what can I do to pass the pain? I have a know problem in my spine anatomy that is called scoliosis and I am very afraid that all this sitting is hurting my back in a way that I will not be able to fix in the future. A. Your scoliosis can make your spine very vulnerable to trauma. Don't neglect this pain. you must go to your physician and tell him about the pain so he will be able to find you some exercises that will be good for you and won't endanger your back.